Pretty Good Solitaire is currently at version 18.1 with 1001 games and improvements for Windows 10. If you have Windows 7, 8, or 10, I highly recommend updating to the latest version. We have how to play videos for a number of the most popular games. This game is at Four Colours. Pretty Good MahJongg, our solitaire with MahJongg tiles game, is on sale right now for 50% off! Pretty Good MahJongg is a collection of solitaire games that use MahJongg tiles rather than playing cards. It includes over 300 layouts for the classic tile matching game, and 55 solitaire games, including original games such as MahJongg Klondike, MahJongg FreeCell, and MahJongg Spider. You can download the trial version at http://www.goodsol.com/pgmj . Pretty Good MahJongg is available for both Windows and macOS. This game is at Twister. PRETTY GOOD SOLITAIRE HOLIDAY SALE - 20% Off This Weekend Only! Pretty Good Solitaire (and all our other Windows and Mac games) are on sale this week only - 20% off! Just order from our site with the coupon code HOLIDAY to get a 20% discount off the regular price of the game. All of our Windows games at https://www.goodsol.com/wingames.html and all of our Mac games at https://www.goodsol.com/macgames.html are 20% off if you use the coupon code HOLIDAY on the order between now and the end of Saturday, December 22nd. Pretty Good Solitaire has updated to version 18.1 with 1001 games and improvements for Windows 10. If you have Windows 7, 8, or 10, I highly recommend updating to the latest version. This game is at Wings. 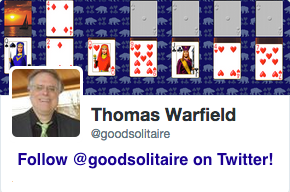 One of the features in Pretty Good Solitaire is a tour. A tour is a collection of solitaire games that are played in order for a cumulative score. To play a tour in the Windows version, just click on the Tours button on the main screen, select a tour, and click on the Play button. There are a number of pre-built tours provided, but you can also create your own. You can take a few of your favorite games, create a tour with them, and play them together. 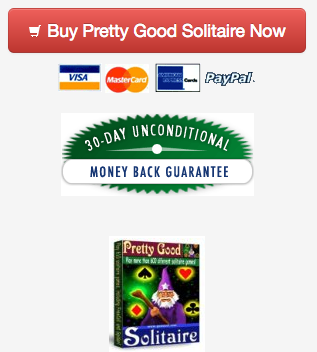 Tours were also (relatively recently) added to the Mac version of Pretty Good Solitaire. There isn't a button as in the Windows game, but you can play a tour by going to the Game menu, select Tour Explorer (as a shortcut, you can also get there by pressing the Apple button and the E key). The Christmas Card Set is a card set with Christmas holiday images on the cards. It is available for all our Windows and Mac games. The Christmas Card Set can be downloaded from https://www.goodsol.com/pgs/christmas.html . Both Windows and Mac versions of the card set are available. This game is at Limited. All of our Windows games at https://www.goodsol.com/wingames.html and all of our Mac games at https://www.goodsol.com/macgames.html are 20% off if you use the coupon code HOLIDAY on the order between now and the end of Saturday, November 24th. This game is at Gate. Pretty Good Solitaire for iPad is 40% off in the iPad AppStore until November 12th. Get it on your iPad at https://itunes.apple.com/us/app/pretty-good-solitaire/id645018925?ls=1&mt=8 . For more details about our iPad game, see https://www.goodsol.com/ipad . The iPad game currently contains 700 games. It is the time of year again for the Thanksgiving Card Set, a card set with Thanksgiving holiday images on the cards. The Thanksgiving Card Set can be downloaded from https://www.goodsol.com/pgs/thanksgiving.html . Both Windows and Mac versions of the card set are available. The game is at Trefoil.